It wasn’t the best start for an extended trip, but then every adventure in the bus includes some kind of mishap. My husband’s always telling me that we’re driving a house down the road and things are bound to go wrong. Luckily he can fix most anything, or get the right people who can. So I may be inconvenienced a bit, but never have to fix the problem. Today we discovered (I say “we” but really mean “he” since I never drive) that the battery for Mr Bus was “low.” That translated into meaning the steps into the coach wouldn’t lower and the stabilizers wouldn’t level. But both were over-ridden when we turned on the generator to power up everything. Ok. No problem. Then in the middle of a busy I75 heading south the side view mirror flew off. Oops – now you can see the cars in the right lane, now you can’t. Meanwhile, we’re a 36′ long bus, close to 30,000 pounds, towing a car; it’s kind of important to see who might be in the right lane before moving over. Luckily the top half of the mirror was still intact, so hubby “just” needed to lean far over the steering wheel to see, best he could, who might be in his blind spot. OK then, no biggy, for me that is. 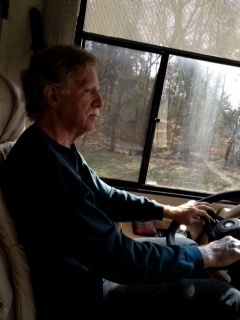 Now that we’re in for the night he’s off in search of an RV supplies store to buy a battery and a side view mirror. This is day one of our multi-week trip. All that said I love our Mr. Bus. He’s not fancy by today’s standards and he’s a 12-year-old diesel pusher. But he’s roomy and comfy and loaded up with the works: frig/freezer, microwave, convection oven, coffee maker, toaster oven, 2 TVs and full bathroom. Usually, everything works just fine. And we get to travel around and taste slices of life from spots we decide to call home for however long we feel like staying. It’s the best. Tonight we’re south of Atlanta. Tomorrow we’re headed to Savannah. Why not? It’s a very cool city and I hear the ocean calling my name. After that? Don’t know yet. Visit and find out! So for the next 6 weeks my blog will be about our travels. Can’t wait. Hope you stay with me and enjoy! 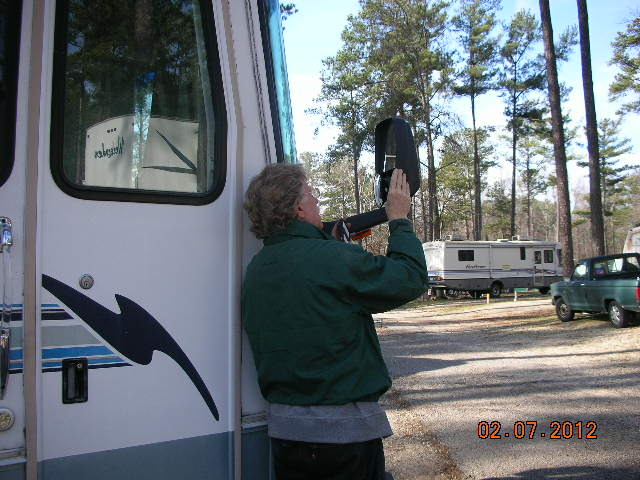 What are your thoughts about RV travel? My husband and I would love to do what you’re doing but it’s a bit hard with a 13 yr old. We did rent a trailer a couple of years ago and went up to Martha’s Vineyard. We had a blast. It’s my travel mode of choice Deb. there’s such freedom. I say go for it 😉 We travel with a 13, 14, and 15 yr. old in ours! Mr. Bus will always need Mr. fixit. No Mr. fixit – no bus – no road trip in a bus. I will just enjoy through your blog! We had dinner at Stingray’s last night and discovered the same thing. I had the famous “Po boy fish sandwich” and Rick had the steamed shrimp. We shared. And splurged on fries. It was delicious. But can’t eat that way every day since we both just lost a lot of weight. So our frig is filled too. Today we’re exploring Tybee – walking on the beach and riding bikes. Will have to find Hostile – sounds wonderful! I want to see the inside of Mr. Bus. You would appreciate that many years ago (when I was married) Dane Topich wanted the three of us to rent an RV and explore the west. Of course, Dane doesn’t drive. I’ll keep checking in your blog. I love Savannah. Looking forward to hearing more. How far south are you going? East or West coast of Fla? That’s so funny about Dane! We discovered it to be a great way of travel, Kweilin, very journey oriented rather than destination. Each time we move we decide where and how far – then find a place to stay and explore. Our plan is down the east cost to the Florida Keys, then back up the west coast and possibly into the panhandle and home. 6 weeks. Marcia, I knew you went, via Fred. I’m figuring it was an incredible experience! I am going to love every single post about this. 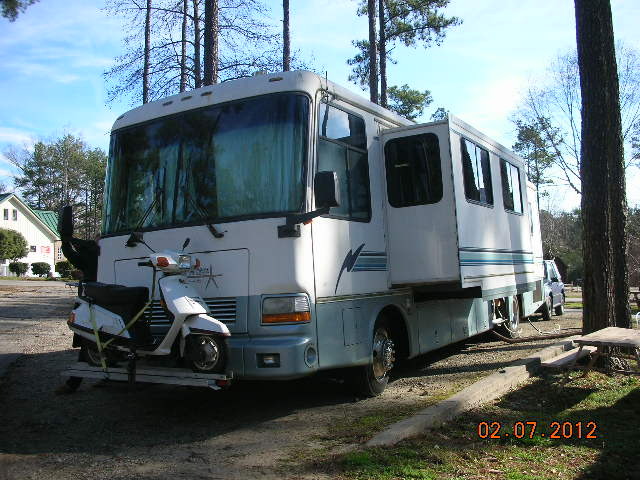 I fantasize about traveling with a group in a Roadtrek, the biggest class B they sell. Have fun and keep those posts coming. Do it! It’s the definition of living.